If bak yew constitutes part of the soul of a good char kway teow, the other part of its soul must surely be snée hum aka blood cockles. These bivalves use to be so commonly found along our coastal lines but no thanks to land reclamation and water pollution, large cockles have become increasingly scarce in our region. As such they also cease to live up to their name, i.e. to be ” truely bloody”. But let’s just savour what we can get and while we can. Who else loves “snée hum” like me? Despite the communal love for blood cockles, few know the true meaning behind the use of cockles in char kway teow. Back in Chaozhou, especially amongst the folks in 汕头 Swatow, blood cockles are a must for ancestral worship on numerous occasions. 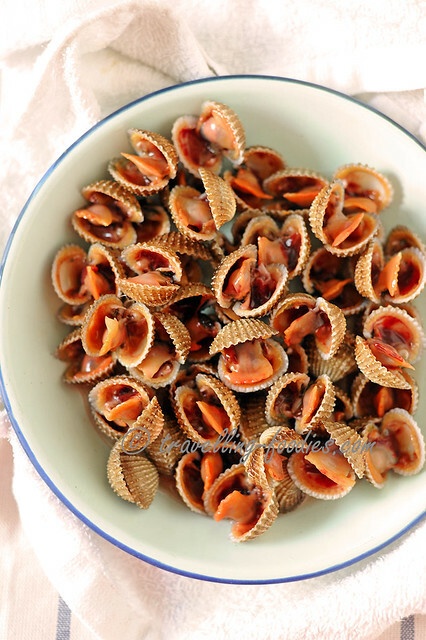 During the Chinese New Year prayers, blood cockles are an integral part of the offerings because long before coins and dollar notes were circulated, the shells of cockles and other bivalves were commonly used as for numismatic purposes to document wealth and transactions. During 清明祭祖 Cheng Beng ancestral prayers, cockle shells were customarily scattered over the ancestral graves in hope for the descendants to be blessed with much riches and wealth as well. 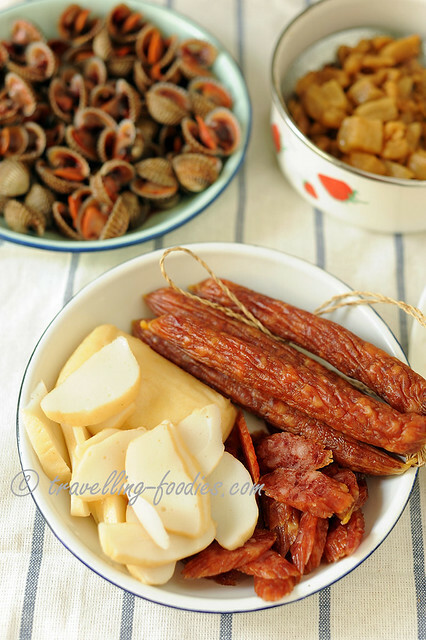 The other ingredients are really common as well, lup cheong aka Cantonese sausages and sliced Teochew fish cake. Apart from these, the vege department would include greens like kai lan or chye sim as well as bean sprouts. 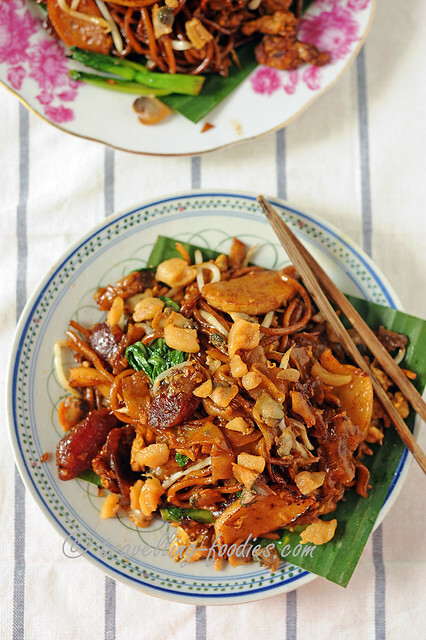 Traditionally, char kway teow included koo chye aka chinese chives as an ingredient as well. 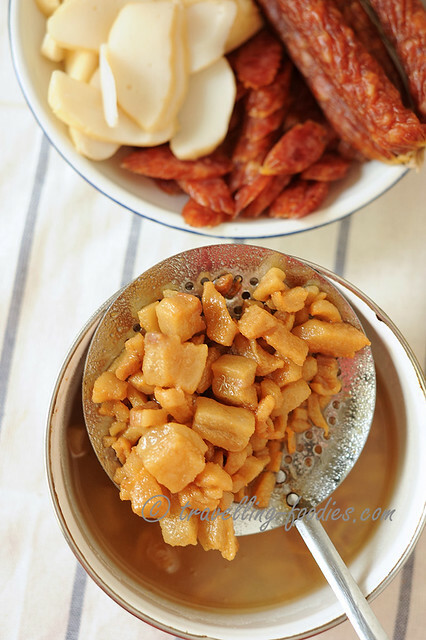 This should come as no surprise as koo chye is quite prominently featured in some Teochew dishes, like 韭菜粿 and 韭菜炒鹹豬肉 etc. However, the practice was “abandoned” by some char kway teow hawkers, particularly those who peddled in “pasar malams” and for an interesting reason. Those were the days when triads and street gangs were a common sight in Singapore, whose members extort from these street hawkers in exchange for “protection”. Payment was made either in money or in free meals and sometimes both. These gangsters who were often involved and wounded in fights “request” for chives to be removed as it was commonly believed to impede the healing of wounds. 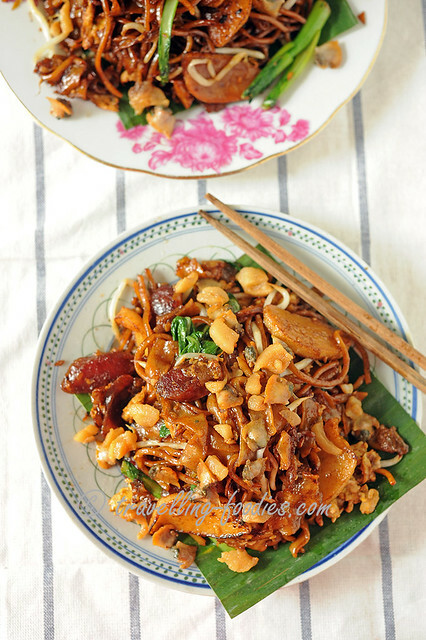 The use of banana leaves as a base in our local char kway teow was a common sight in the past, just like how opeh aka dried lower parts of a betel nut leaf stalk were used as for the noodle takeaways. This practice too was somehow forgotten but still thrives in other parts of the Chinese diaspora were char kway teow is too a popular favorite, like in Penang. 4-5 stalks of chye sim, stem and leaves separated. Thick stems should be halved or even quartered. To a heated wok, add lard oil, kway teow and noodles. Stir fry under high flame until noodle strands get slightly brown and smokey. 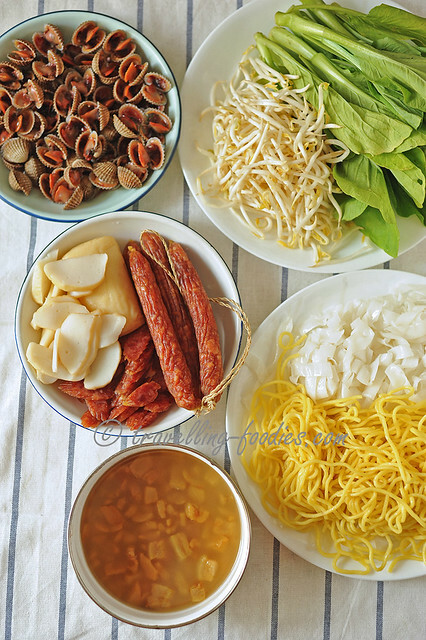 Add chye sim, fish cake, lup cheong, bean sprouts and stir fry slightly. Drizzle fish sauce, dark soya sauce, dark sweet sauce over the ingredients and stir fry until every strand is well coated. Add some hot water or stock at this point if the noodles get too dry. Put the ingredients to one side of the wok and crack the eggs in the middle. Scramble slightly and push the ingredients over the eggs. Stir fry until everything is well mixed. Add blood cockles over the ingredients and give everything a good toss before turning off the flame. It should take no more than a couple of seconds. Plate up and sprinkle “bak yew pok” generously over the top. This entry was posted on April 20, 2017 by Alan (travellingfoodies). It was filed under General, Simple Eats and was tagged with char kway teow, chinese, chinese sausages, cockles, fishcake, fried noodles, hawker food, lardon, pork lard, singapore food, teochew.